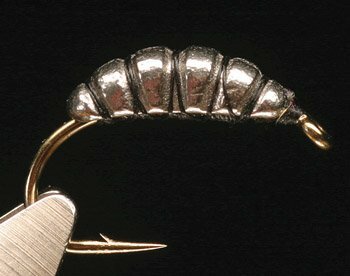 The Ribbed Tungsten Scud Body is a awsome new concept when it comes to weighting your Czech Nymphs. Fits right on top of the hook shank and attaches with thread. You can dub over the entire tungsten body or dub the hook shank the desired color, attach the tungsten body with thread, pull a shell back material over the top and rib with wire or mono. Now you can take a permanent marker and color the body. 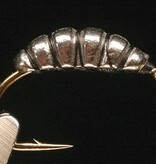 A super easy way to tie heavily weighted Czech Nymphs is just seconds.